ArtCrawl Harlem and Souleo Enterprises presents Motown to Def Jam, tickets now available | HarlemGal Inc.
ArtCrawl Harlem™ and Souleo Enterprises launches Motown to Def Jam, a multi-gallery visual art exhibition celebrating songs from the Chess, Def Jam, Motown, Stax and Philadelphia International Records catalogs, from June 11 through June 30, as part of African-American Music Appreciation Month. Specially commissioned works by over 40 painters, sculptors and new-media artists will be on display at four Harlem art galleries: LeRoy Neiman Art Center, Strivers Gardens Gallery, La Maison d’Art and The Sol Studio. Participating artists include Aanisah Hinds, daughter of Grammy-winning singer Macy Gray, and S. Ross Browne, 2011 winner, Bombay Sapphire Artisan Series. On June 15 a four-hour trolley-bus tour – led by expert guides and culminating with a dinner gala at Broadway Housing Communities’ Rio Galleries featuring popular performers from the Metropolitan Transit Authority’s Music Under New York paying tribute to the legendary labels – bolsters the kickoff. 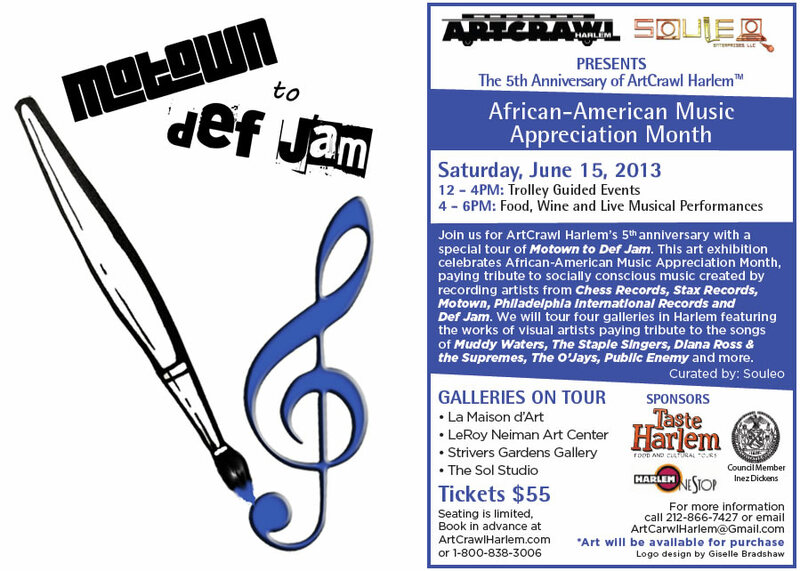 A limited number of early bird tour tickets are available for $55 at ArtCrawlHarlem.com or by calling 1-800-838-3006. This entry was posted in art and culture, Community, education, Events, Harlem, Harlem blogs and tagged art and culture, art and culture in Harlem, ArtCrawl Harlem, Def Jam, Harlem, Harlem Blogs, music, Souleo Enterprises. Bookmark the permalink.